I try not to look at these things as “national holidays” but gentle reminders of ways we can improve our lives. Given the current economic climate, everyone seems to be more concerned than ever about money. Having systems in place can reduce stress, save time, and save money. Almost every client who contacts me has those 3 criteria listed in their reasons for wanting to get more organized. Getting more organized does pay! Don’t wait; start TODAY! Have a designated place for all incoming bills. Decide on a schedule to pay bills and stick to your schedule. Have a place to pay your bills. Have everything in one place to streamline your bill-paying process: checks, pen and pencil, a calculator or calculator program like Excel, any payment coupon booklets, postage stamps, envelopes, return address labels, and a stapler. 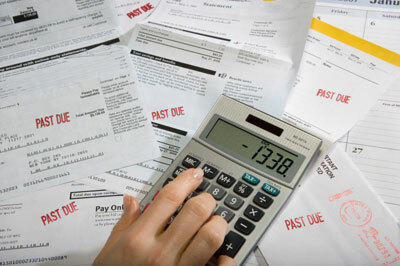 Balance your checkbook prior to actually paying bills. If you have a joint account, this is the time to communicate with your spouse or significant other to make sure all debits and credits have been properly entered. Have a Master Checklist for all bills. With companies encouraging us all to go paperless, oftentimes if we don’t have a Master Checklist, a bill could be missed; you might incur late fees and/or additional charges. Suggested columns for your checklist: Date of Month Due / Payee / Paper or Paperless Bill. Automate where possible or where you are comfortable. For example, bills such as your monthly cable bill can be automated to 1 credit card or auto draft to your bank account. You can opt whether you still receive a paper copy of the bill each month. A note of caution: It is your responsibility to review all bills. Phone companies are notorious for attempting to slip through “3rd party” charges to unknowing consumers. Consider reducing the number of credit cards you actually use to 1 or 2 debit or credit cards. The rewards: less bills coming in; less bills to pay; simplified record keeping; and simplified filing. Those department store and gasoline credit card “rewards” are not truly rewards in the big picture. Simplify your filing routine. If the bills you pay have no Tax or Legal implication, consider filing them by the month you have paid them (Jan / Feb / March …). See if you qualify for cheaper credit cards. If you have a credit card at a bank, you may be throwing away money. Simply ASK your current company is you qualify for a reduced rate due to your timely payments and FICO score. If not, check out options at a credit union where reduced rates are often offered. List your credit cards, with the highest rate card first. Include the balance, the interest rate, and the minimum payment. Every month: pay extra on your credit card with the highest rate. The goal is to pay that baby off! Keep doing this until all your credit cards are paid off. Every month: as you pay off your high-interest cards, start paying money into a savings or investment account.